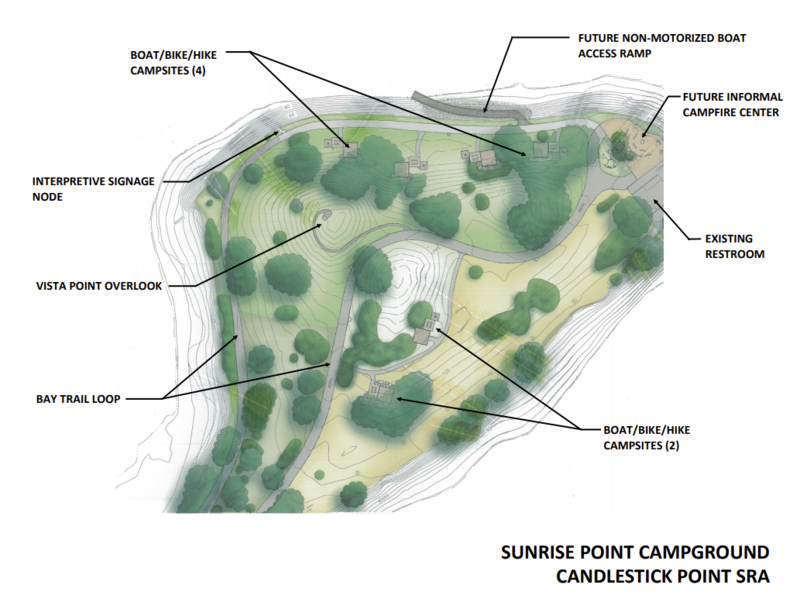 The Campground at Candlestick Point SRA (hike, bike, and boat access only) will be available ONLY by reservations starting October 1, 2018. Fees for camping are $35 per night. Please click the reservation link for availability, or call 1-800-444-7275 (PARK). The campground is accessible via the San Francisco Bay Trail (hike/bike) and the San Francisco Bay Water Trail (boat). Due to its limited features, the campground is designated a Primitive Campground facility. The campground is located at Sunrise Point at the park. It contains six accessible campsites, accessible trails, potable water and flush toilets. Campfires/ground fires are not permissible, but there are BBQ grills and food lockers at each site. There are no showers. Check-in is 2 pm and checkout is 12 pm. Campers are welcome to a maximum stay of two nights. Plan ahead to arrive at your campsite before dark. Only service animals can stay overnight in the campground. There is not any vehicles access to these sites and vehicles may NOT park overnight at the park. These campsites may be reserved for people who are hiking or biking from one location with the goal of continuing to another destination or by non-motorized vessel to their campsites. Boat campers with reservations may launch non-motorized vessels from the sandy beach at Jack Rabbit Beach or from the Windsurf Circle beach area. Campers are allowed a maximum stay of two nights. There is no vehicle access to the campsites. Campsites were designed for individuals that can access the sites by hiking, biking or via boats. All campers are required to register and pay their fees ahead of time through ReserveCalifornia. Boat campers with reservations may launch non-motorized vessels from the sandy beach at Jack Rabbit Beach or from the Windsurfer Circle Area. No vehicles allowed in sites. Vehicles may NOT park overnight at the park. No pets allowed (except for service animals). Candlestick camping is accessible via hike in, bike in, or non-motorized boat only. Online reservations can be made starting October 1 on California’s new reservation system www.ReserveCalifornia.com or by phone at (800) 444-7275 (PARK).